There is a mystery in darkness that cannot be ignored. It is intriguing, drawing us closer to explore and investigate its mysteries, even while it can be a bit intimidating. It’s the not knowing… the not being able to see that makes us curious and understandably worried. Sort of like when you are in your home, relaxing, and hear something that doesn’t be long. Perhaps it is a sudden shattering of a family heirloom. Maybe the creaking of the cookie cabinet door in the midst of the night when you swear you should be alone. Or, and even worse, it might be the sudden silence that permeates the house… a silence where there is normally an expected level of chaos leading you to know that something far more terrible is occurring! Naturally, we’re talking about those kiddos. Phew, can they be full of surprises. It’s hard to tell exactly what’s going on in their little heads between the swarming creativity and mischievous antics that they’re planning even while they look at you with such innocence in their beaming faces. Who can trust something so cute yet equally devious!? 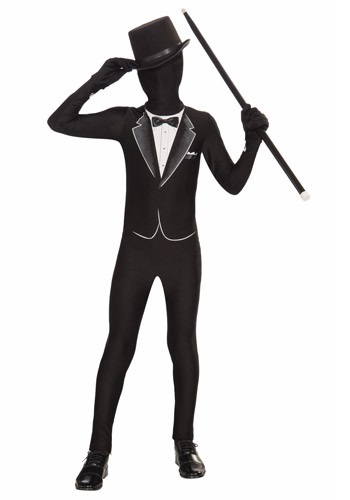 Well, we’ve come up with the perfect symbol for their identity in this Kid’s Format Tuxedo Skin Suit. This polyester knit fabric skin suit has enclosed feet, attached gloves, and a hood that all connects with the magic of Velcro. The suit has a printed lapel and formal shirt for that grace of elegance, while the shadowy silhouette of your kiddo stands out as an enigma that will obviously take your whole life to completely puzzle out. Accessorize with a black top hat and cane for a shadow-kid perfect for a galla, formal dinner, or ballroom dance competition. We can only hope that giving into the enigma will keep them from getting into too much at the house in the mean time! I ordered both my son's costumes through here this past year. Both? Yep I ended up ordering two because the first one other everyone down the line show it was delivered we never saw it on our doorstep. Unfortunate for us, good for someone else because they probably got a really great costume for there size medium child. Your welcome. Anyhow, what I want to talk about is the fabulous customer service I received once I realized that the costume was missing in action t-5 days to Halloween including an upcoming weekend. I called and the customer service Rep that I spoke with talked it through with me. He never argued with me nor did he accuse me of lying or even give me the impression that he thought I was. He just assisted me in a short amount of time in getting a replacement costume delivered in time for the big day. It only cost me an additional $10 for guaranteed overnight delivery. He saved the day for my 10 year-old son and he saved me a lot of additional money. Thank you Halloween Costumes for empowering your employees to give fabulous customer service and make decisions on the fly to make the customer happy! I will definitely buy costumes from here in the future. If I don't get uber organized and find the time to actually make the costume like Pinterest somehow manages to make me think I can do. Fortunately, for my son it is at the ninth hour when there is absolutely no time to possibly get it done when the costume has gone MIA. Thanks again from a grateful Mom and a very happy 10 year-old! I'm so sorry to hear that the first one didn't show up, but it makes me very happy to hear that Customer Service was able to fix the problem! I hope your son enjoys the costume as much as possible, and if you have any other questions in the future don't hesitate to contact us. Thanks again!